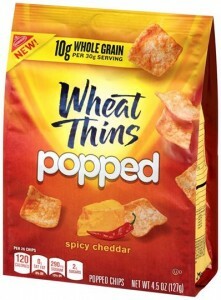 Click here to visit the Wheat Thins twitter account and follow them. Then tweet something with the hashtag #PoppedWheatThins and if you’ve won, you’ll receive a direct message within a few seconds with a link to request a free bag of Wheat Thins Popped! There will be a new winner every 10 seconds from now until 1:30pm (eastern time) and between 3:07pm – 8:00pm. You can tweet up to 6 times per hour. Good luck!